Ever since mankind discovered the intoxicating possibilities offered by a few readily available ingredients and a little crude chemistry, the debate over alcohol has raged. And nowhere more loudly than in America. The shouting match between drinkers and distillers on one side and teetotalers and tax agents on the other has created a din that predated the American Revolution, peaked during Prohibition, and continues, unabated, today. 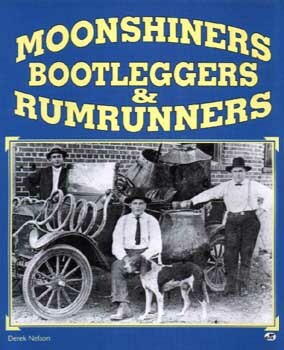 Moonshiners, Bootleggers & Rumrunners is filled with the exploits of shifty-eyed moonshiners tending backwood stills; daring bootleggers hustling cars laden with "tax-free" whiskey over rural highways; revenuers pursuing their quarry on foot, in cars, and from airplanes; and rumrunners and Coast Guard ships engaging in the occasionally fatal "booze ballet". More than 125 black and white historical photographs accompany this thoroughly researched and entertaining look at America's love/hat relationship with "demon rum."